Orbital cellulitis is an infection around the eye. It affects the muscles and soft tissues around the eye. It is a serious problem that will need treatment. If it is not treated, it can lead to blindness and nerve damage of the face. 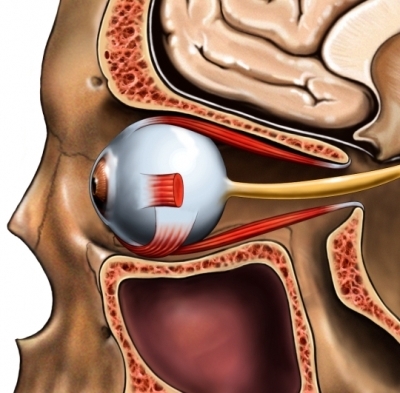 The cavity below the eye is a sinus, the most common place for the infection to start. The doctor will examine the eyes, teeth, and mouth. You will be asked about your health history. This is often enough info to make a diagnosis. Orbital cellulitis can get worse fast. A hospital stay is often needed. This will allow rapid change in treatment as needed. Pus may need to be drained. It may be taken from an infected sinus or orbit. Treat sinus or dental infections right away. This may prevent the spread to the eyes. Hib B vaccine may also help to protect children. Distinguishing periorbital from orbital cellulitis. American Family Physician website. Available at: http://www.aafp.org/afp/2003/0315/p1349a.html. Accessed May 26, 2015. Orbital cellulitis. EBSCO DynaMed Plus website. Available at: https://www.dynamed.com/topics/dmp~AN~T115737/Orbital-cellulitis . Updated December 15, 2014. Accessed May 26, 2015. Givner LB. Periorbital versus orbital cellulitis. Ped Infect Dis J. 2002;21(12):1157-1158. 1/5/2015 DynaMed Plus Systematic Literature Surveillance https://www.dynamed.com/topics/dmp~AN~T115737/Orbital-cellulitis : Pushker N, Tejwani LK, Bajaj MS, Khurana S, Velpandian T, Chandra M. Role of oral corticosteroids in orbital cellulitis. Am J Ophthalmol. 2013;156(1):178-183.